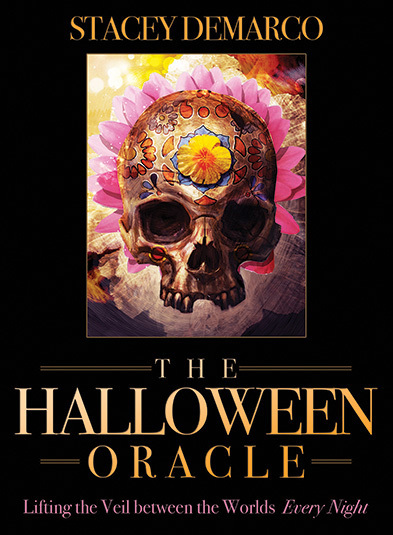 This was the card drawn when we first began the Halloween Oracle in September. It has returned as we proceed through the daytime hours of Samhain, summer’s end. Here, the weather certainly fits that with a drippy 47 degrees (I’m not complaining – I love this weather). 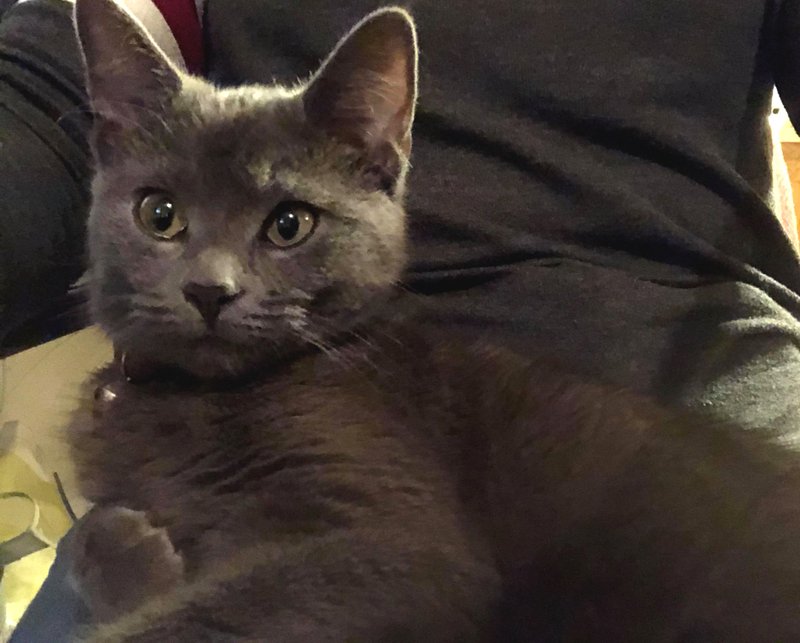 New kitty Cerridwen was feeling lovey and parked on my lap as I drew today’s card. I think she would have preferred the Hearth card for today. I hope you all have a blessed day and remember the might dead while embracing the mighty living. Blessings! Halloween is a scary festival. It is meant to frighten. We are meant to feel the release of being pleasantly scared. We trick-or-treat even though we know that someone may surprise us, we watch horror films knowing they will scare us, we even dress as skeletons who have no flesh at all and their bones are there for all to see! In short, we show our vulnerability at Halloween and our strength in facing our fears too. There is incredible strength in showing vulnerability. It can often be the bravest course of action and the most frightening. More often than not, it is a powerful catalyst for person growth even though we may not be able to perceive that at the time. By showing our true selves and displaying some balanced vulnerability, we can seek and receive greater understanding from others. By admitting that we are wrong or that we don’t have the solution when we are expected to, we leave more room to turn things around faster. By asking for help and support rather than acting as martyrs and feeling resentful shows strength and wisdom, not weakness. 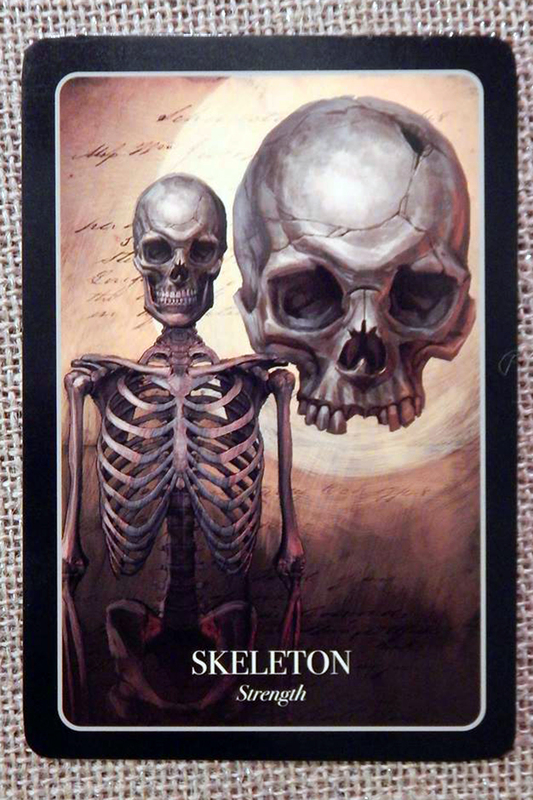 Should the Skeleton card bring itself to your attention, dare to show strength and vulnerability if that is what you really feel. Shame, pride, or embarrassment are heft burdens that need not be carried through the darkest of nights. 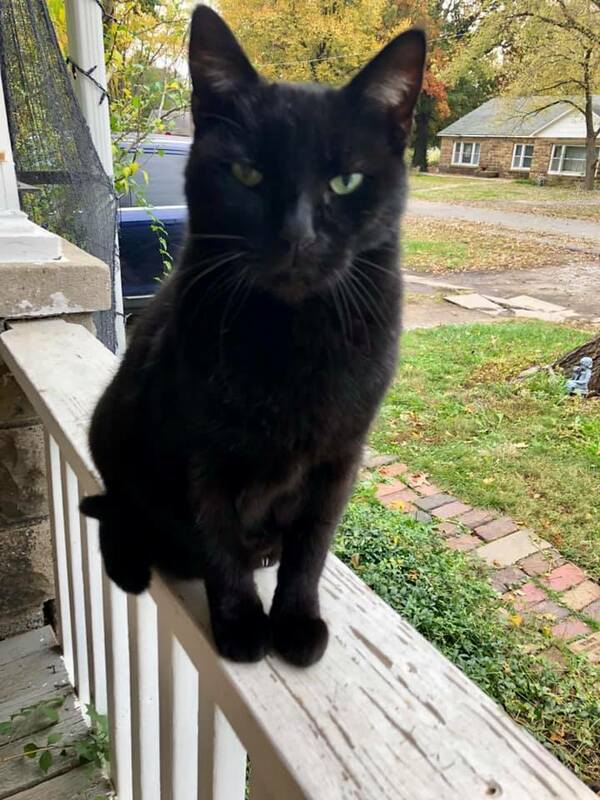 First, Tommy the Porch Cat says Happy Halloween and Blessed Samhain! I’ve been MIA a lot the past week. The last couple days I got busy early doing stuff around the house and yard, and we’re trying to empty a storage unit. (I’m sure many of you know how hard that is!) Even the Beloved Dead altar, the high schooler’s costume, and pumpkin carving has been a bit last minute, but we did get it done. I’ve had to add three people and two pets to the altar this year, which makes me a little sad though I know we are doing the altar to keep them in our hearts. In regard to the cards today, I thought the spread was spot on for the holiday! We have the Graveyard representing unnecessary fear, the main card is Trick or Treat for mischief and play (how appropriate for today! ), and finally Dawn for the light after the darkness as we head into the dark season of Samhain. Even though it’s the time to go within and to rest in the darkest part of the year, we still have the light within ourselves and the knowledge of the returning light next spring. There is always hope. Blessings to you all! Here’s to a fun and safe Halloween and a beautiful and thoughtful Samhain. Trick-or-treating is such a fun thing to do, is it not? Yet, why do we trick-or-treat? Today, trick-or-treating is a huge event. We spend much time, money, and effort dressing up as our scariest creatures and this has even extended to dressing up as our favorite celebrities and other pop culture idols. Instead of traditional candy apples and barmbrack, we give out a mind-boggling variety of candy. It matters not – the idea of frightening away death and darkness still stands. I believe that the modern trick-or-treating also unites communities by introducing our families and friends to those around us in a non-threatening and joyful way. Many of us do not know our neighbors – even those who live next door – and Halloween gives us an excuse not to be so reserved and extend our boundaries. 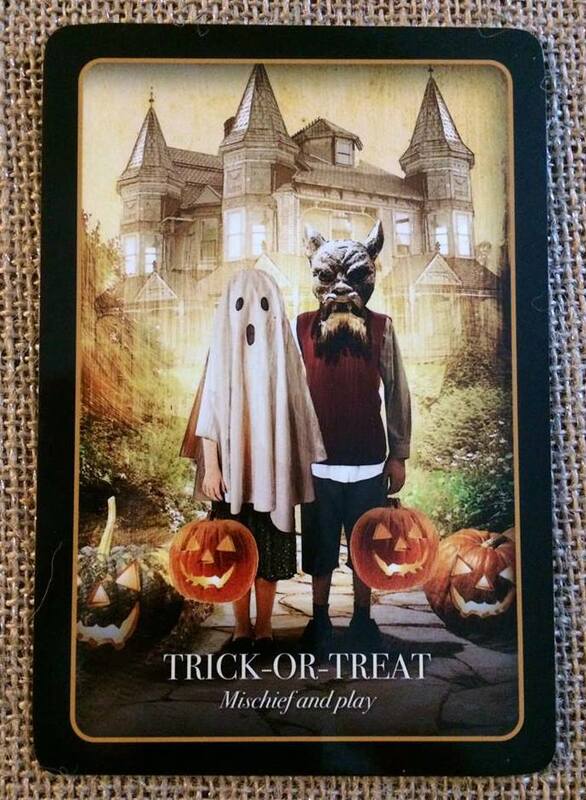 Should you receive the Trick-or-Treat card in your divination, it may well be a time to examine your own life. You don’t have to be a child to let go and have some playtime and you can extend the fun to others. Sometimes we are afraid to make mistakes and play is one way to alleviate the pressure that we sometimes place on ourselves to get everything perfect every time. Alternatively, it is worth knowing that there is a balance between manipulation and mischief – the former is not pleasant and the other has at its core a sense of irreverent fun. Looking for more Samhain-related posts? Here’s some past posts: Honoring the Ancestors, Embracing the Wise Crone, and Herb or Rembrance, Herb of Samhain. Happy Halloween and Blessed Samhain to all of you! It’s been a while since posting something other than the Halloween Oracle Card of the Day (on Facebook), but this time of the year always makes me want to get back to the keyboard. Of course, I’m not alone and I’read many blog posts and articles about this beautiful season and what we learn from it. 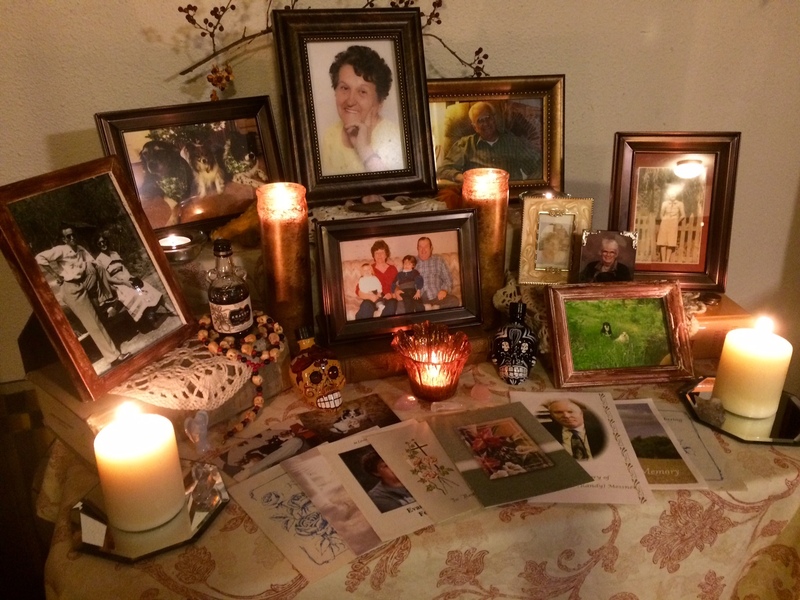 We see how others deal with loss, and Heron Michelle from Patheos wrote how we as Pagans should do more than honor and celebrate the dead but also prepare for own death even in practical ways. It’s an excellent and honest article. I lost my Mom a little over two years ago, and I do know that Michelle’s words ring true as my Mom had taken care of everything for her funeral and burial except her head stone, which she always said she would leave for us kids to pick. When an undiagnosed liver disease finally became known, we had precious little time with her and it was a blessing to not also worry about her medical wishes, funeral expenses and so forth. Planning all of that years ago was a gift my mother may not have even realized she was giving. However, I my biggest Samhain lesson from losing the most important person in my life is this: Don’t wait to live the life you want. Mom was one of those who worked hard at underpaid and underappreciated jobs all her life. She raised four kids and showed great resourcefulness in keeping us fed, clothed, and sheltered on a tight budget. Even after retirement, she had to work to make due. With undiagnosed illnesses (for him, it was dementia) affecting their personalities, my mom and stepdad divorced when she was in her late 60s. What little savings they had was split. They had to lower the price of their home to sell it, losing money in the process. Her last year was stressful as her tight budget, her medical issues, and mental confusion combined to make life very difficult, even with three daughters hovering over her. Mom’s “golden years” had become pretty tarnished. All her life she had planned to travel and relax in retirement – that dream mocked her as she struggled to get by. Sadly, I see so many people go through this same thing. They focus all their energy on work or professional goals or doing the things they “ought” to do, thinking they can work on their real dreams or just take time for themselves later. So many have their retirement dreams cut short illness. For others, it’s financial surprises that ruin their plans. The fact is that even careful planning can be for naught in some situations. We simply don’t control as much of what happens to us as we think. 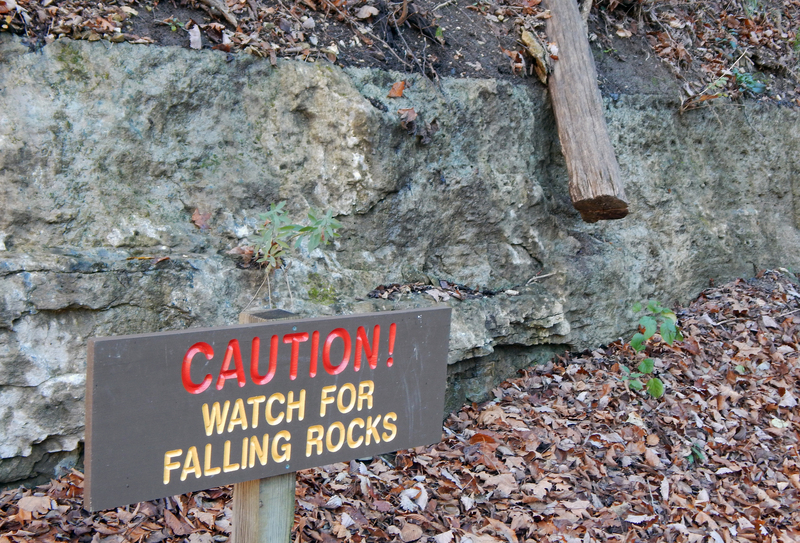 It reminds me of a picture I once took where a sign warned about falling rocks, but a log was falling in the background instead. Life is like this: prepare for one thing and something different will happen. And as I put up my Beloved Dead altar every year, I’m reminded of this lesson. This is why I don’t work overtime. Yes, I have what many consider a good job, but the fact is that the company really cares more about its bottom line than it does about me. And while it’s a good job, it’s not exactly a dream job. So I’d rather spend my extra time for me or with the ones I love. This is also why I saved some of the insurance money leftover from Mom’s final expenses to travel to Ireland next year. We have some Irish heritage, so I know my Mom would have approved – but it’s the place I’ve longed to go to for the longest time. This is why I allow myself the really good chocolate and time to write. This is why I took up an old hobby that brings me joy. It’s why I try to focus on smiling and laughing with friends and family rather than getting too involved with things that bring a lot of unneeded stress. Many Pagans quote the “live in the moment” philosophy and yet are often as bad as the rest of Westerners about taking time for themselves and honoring their real life goals and dreams. We are not immune to the disease of just getting by or wasting time on things that don’t fulfill us. No matter who we are, the fact is that life is much shorter than what we imagine. Let’s not waste it. • I’m ready. Are you? Daily Halloween cards are coming! OK, this is early, but I can’t wait anymore. Normally, I start the daily card pull from the Halloween Oracle in October and go through November. Well, I’ve felt the urge to use these cards much earlier this year, so I’m starting a month early and will go through all three fall months (well, for northern hemisphere folks) with the daily reading. As many of you know from my review post, this deck speaks to me quite a bit. Many of my friends have stated that they felt the veil would thin earlier this year, so perhaps I’m right on target for feeling the need to start earlier. Whatever the reason, I hope you enjoy it. I’ll post about one reading a week here on this blog, but most of them will be posted directly to the blog Facebook page, so please look for them there starting this Thursday, Sept. 1! 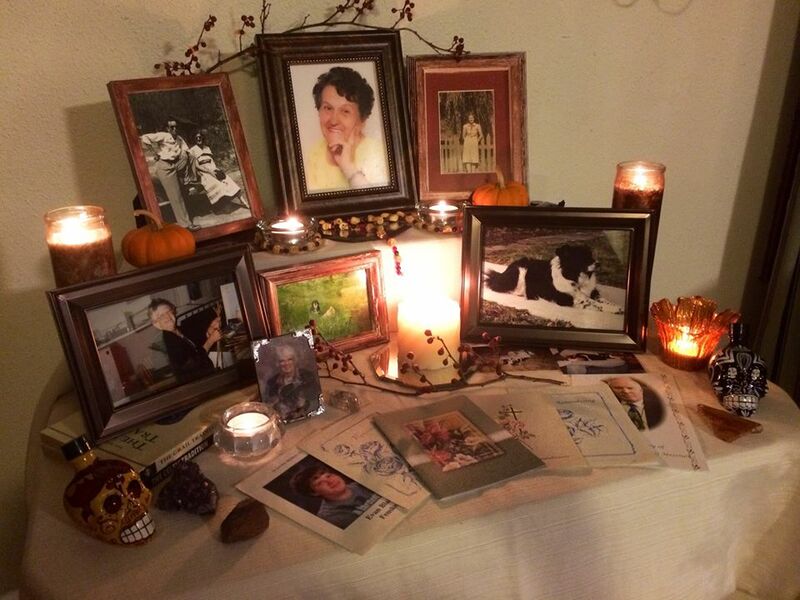 Every year in the days before Samhain, I either move or take down my everyday altar and put in its prominent place is the Ancestor Altar, which I call my Altar to the Beloved Dead. It is something I cherish doing and something that is adjusted every year and also reflects what is important to me. Every night for the week before Samhain and week or two after, I take a few minutes to light the candles and remember the Beloved Dead represented there. Many of us do this and, frankly, ancestor altar building is covered in many places, so never felt the need to do it here. But every year when either people see my Ancestor Altar in person or on a blog or Facebook photo, I inevitably get someone saying they just don’t know how to go about building their own. They don’t know enough about their family, or they had issues with their family. Or they don’t know where to start. I’ve been told many reasons. Considering how important and sacred this altar is to me, it makes me sad that there are people who want one but don’t feel comfortable building one. So for those who need a little nudge, here’s a quick and dirty write up of my philosophy on building the ancestor altar. I will say that I personally do more than ancestors of my blood. As discussed in this essay by Druid author Joanna Van Der Hoeven, I welcome ancestors of blood, of place, and of tradition. There is no way I could limit it to just relatives – there have been too many people that were important to my spiritual development to ignore them just because we do not share physical DNA. We share spiritual DNA, and that’s good enough for me and many other Pagans. So, even if you don’t know your family, were adopted, or are estranged from family, you can still build this based on the people who have been important to you in one way or another. It could be a spiritual leader or counselor, a family friend, a coworker, or even a pet who has passed on. It could be someone you didn’t know but who inspired you. For example, the last couple years I included the late frame drummer Layne Redmond – her music and research was very inspiring and empowering for many of us women who took up the drum. And the drum has been a big part of my spiritual life. I start, of course, with a table and tablecloth. This year, I added a box in back under the tablecloth to add more height and dimension the the arrangement. Do what will look good to you. I also have a lot of candles – but you could use some other type of lighting that you prefer. 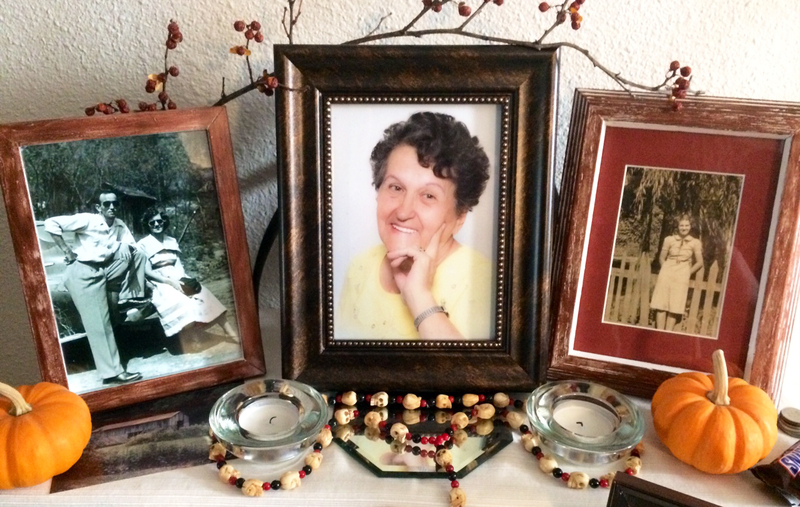 At the top, you see three photo frames with my great aunt and uncle, my Mom, and my grandmother when she was young. These are all from my mother’s family. I choose not to include anyone from my father’s family because they are negative, not well-known to me, or not yet deceased. My mother’s family has its flaws, but they weren’t intentionally hurtful and did the best they could. I personally wouldn’t include anyone whose spirit might not be in your best interest because not only are you honoring ancestors with this altar but also inviting them in, whether you realize it or not. There have been many people in my life totally unrelated to me that have had a powerful impact on my life. Two examples are my first two Crones: Sandy and Bernice (I’ve written about Bernice before and recently reposted it). Bernice was my ex-husband’s great aunt but our friendship opened my eyes in so many ways. Sandy was one of the women who started the Daughters of the Sacred Grail, an Avalonian women’s group that really helped firm up my spiritual foundation. al friends have often been a true source of love and support. I would never leave them off this altar, so I would suggest people not feel limited to just humans. This section is a little more flexible for me. In some sense, I also consider the late Crone Sandy an ancestor of tradition as well as of place. Yes, I knew her in this world, but she also helped lay the groundwork for my spiritual tradition. Some of what I do spiritually is because of her. It could be a leader like the Pope or Dalai Lama. Some may disagree with me, but it might also include something to represent a spirit guide or spirit animal. After you have found a photo or something to represent anyone who fits these, simply put them together in a way that pleases you. You could add more common altar items that represent the four elements, deities, etc. You could put out little items you think the Beloved Dead would appreciate – I always put out a Snickers and change for my grandmother. You can incorporate other meaningful things to you such as things from nature (like the gourds and bittersweet you see on mine) or whatever inspires you. And think it’s too late? You have tonight and tomorrow before the calendar Samhain on Nov. 1. And astrological Samhain isn’t until Nov. 8 this year. Plenty of time to remember those who have gone before in however big or small way that you wish. Bright blessings and wishing you all an inspired and magical Samhain! Halloween Oracle of the Day – a Samhain treat! Just this week and next week (for the main part of the Samhain season), I’m pulling a card a day from the Halloween Oracle by Stacey Demarco on Parting the Mists’ Facebook page. 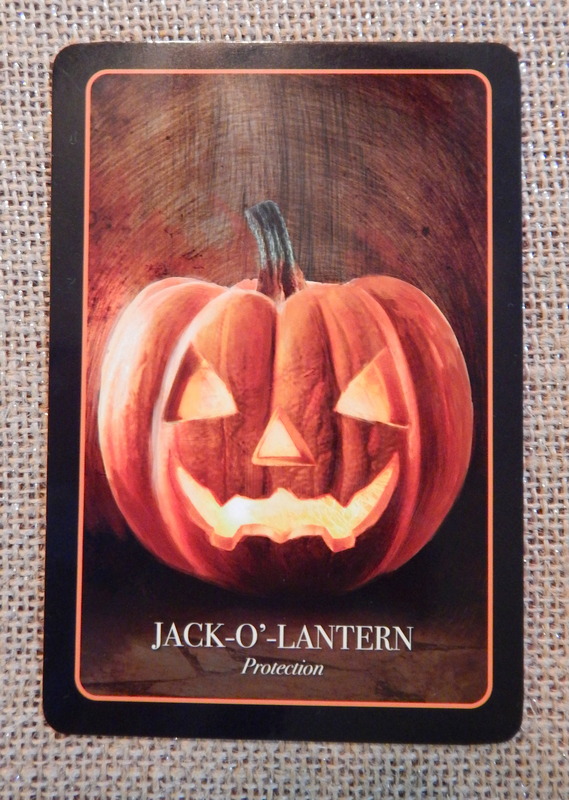 Today’s card, appropriately enough for the first one, is the Jack-o-Lantern. If you want me to post each day’s card here too, let me know in the comments. Halloween wouldn’t be the same without the carving of pumpkins into scary jack-o’-lanterns. Glowing menacingly from porches, dinner tables, and porches everywhere, Jacks actually have a rich history and a spiritual bent. The original for a jack-o’-lantern was a will-o’-the-wisp, and old British term. The will-o’-the-wisp was a small bundle of sticks used as a flame or torch. The Irish and those living in the Scottish Highlands all carved winter vegetables – not just pumpkins but also parsnips, carrots, and beets. The time around Samhain (Halloween) was of course when the fae and goblins were said to be roaming wild and so the lanterns were intended to be both scary (scaring off the undesirable) and to light the way in the dark. Today, carving pumpkin jack-o’-lanterns has become an art in itself and a true icon of Halloween. Intricate designs both scary and funny can be found in almost every home that celebrates the holiday. Both electric light and candles now illuminate the inside of the lanterns. Know that you are protected and that you are capable of creating the life that you want and that the universe supports you in this should Jack shine his light upon you. Boundaries are important to teach people how to treat us and drawing this card indicates that you may wish to renew the ones you have or to establish new ones. We are just a day away from the start my favorite holiday. I say “start” because for me, it’s not just one day for Halloween and Samhain – it’s many days (sometimes a few weeks) devoted to both the fun festivities and the serious introspection and respect that tumbles all together with Halloween, Samhain, All Saints and All Souls Days, and the Day of the Dead. 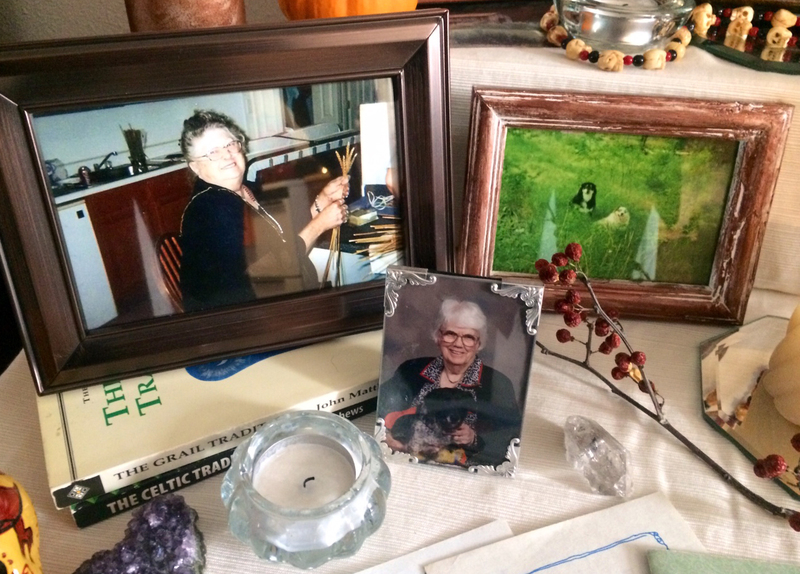 Early this week, I completed the annual expansion of my small ancestor altar into a loaded table I call the Altar to the Beloved Dead. But I got an earlier start thinking about the spirit of the season this year. In mid-September, I picked up Stacey Demarco’s brand new deck, The Halloween Oracle. Before telling you my thoughts on the deck, let me admit that I’m not the most skilled of readers. I read oracles and Tarot for myself yet have never read for others, but this deck is making me reconsider that. The cards are darkly beautiful and sophisticated in style, and they are printed on glossy sturdy paper that will hold up for years. I find them to be an easy read – I can connect with the image, title, and theme of almost every card without feeling the need to reach for the book. Only a few gave me pause, notably the Zombie card that represents control. A young friend reminded me that Hollywood’s diseased and rabid zombies have altered our perception of these, and that the original zombie is indeed someone who’s life is under the control of another. Problem solved. 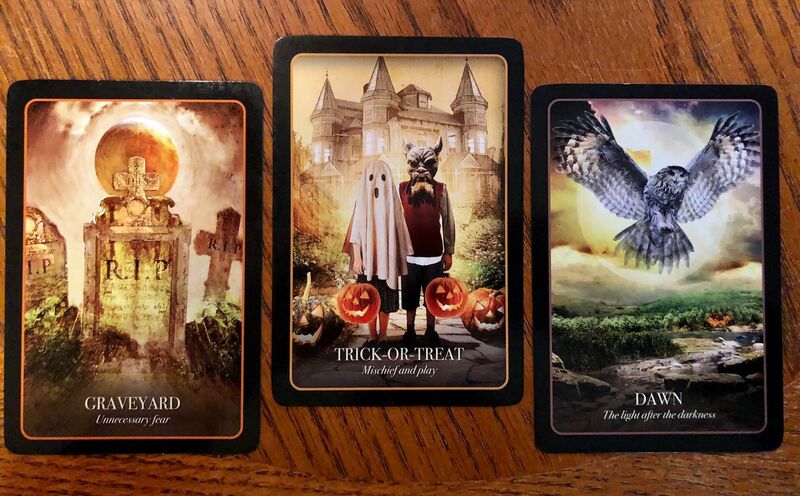 Throughout the deck, Demarco continues to adhere to the traditional and folkloric aspects of Halloween and other related festivals, which makes it easy for those who have learned about this subject to read from this deck. From barmbrack and cauldrons to ancestors and the Underworld, this deck doesn’t miss much about this season. While the entire deck is intriguing, a few cards did sing to my soul. Seeing the Winter card and its focus on “the sacredness of pausing” makes me happy. As long-time readers might remember, I have long been someone who encourages folks to find time in the hubbub of the winter holidays for introspection and spiritual rest. And the starkly beautiful image really speaks to me. 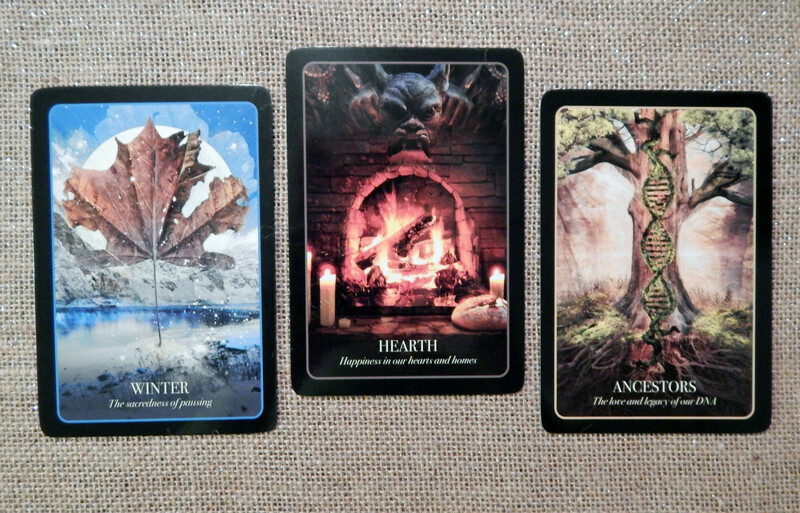 The Hearth and Ancestors cards, each very important thematically to me, are also fantastic expressions. The Hearth’s glowing fire wards off the surrounding darkness as the protective gargoyle looks over those who we imagine gathering round the fire – summing up the combined warmth and protectiveness many of us feel about our homes as well as the energy we put into home and family. Metaphors of family roots, family trees, and DNA are all woven into the Ancestors card that also suggests the action of spiraling upward, which many of us aim to do in our spiritual work. Lady de los Muertos proved a pleasant surprise when first thumbing through the deck. It’s nice to see another culture so clearly represented (the Mummy card with the Egyptian pyramids in the background also escapes the western European model). 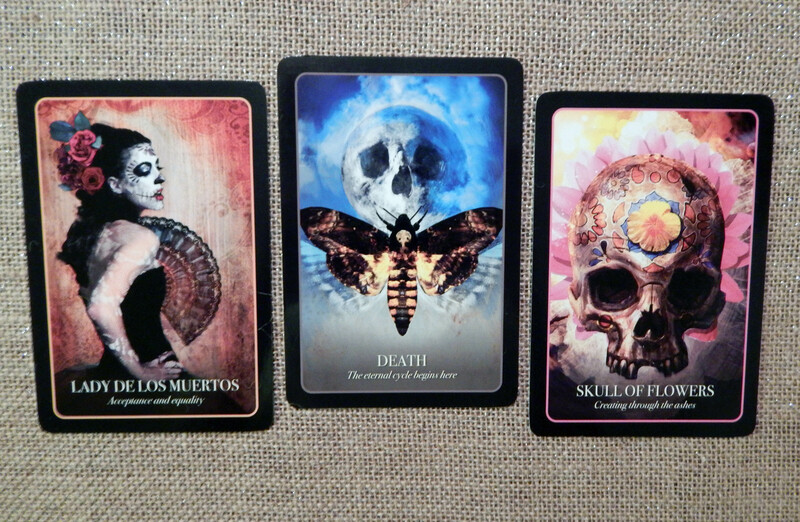 The Death card features the very same Death’s-head moth of Silence of the Lambs fame but finds a more helpful expression here as it faces the Moon, also a representative of an ongoing cycle and transition. The Skull of Flowers (one of four “Skull of” cards) is just beautiful and intrigues me every time I see it. While some of the 36 cards shine a bit brighter than others, the only real complaint I have about the deck is the accompanying book. And it’s really not so much what she writes as the punctuation. The lack of the Oxford comma is annoying and, in a few cases, confusing. However, there’s a general misplacement of commas throughout the book. As I have been filling in on a daily oracle page with this deck and typing in the book’s entries, I have grumbled more than once while removing some commas and adding others where they are really needed. And then there is the annoying use of the “whilst” instead of “while,” but that is more common in Britain – if my dictionary can be trusted – and that may also be true in Demarco’s home of Australia. Perhaps that’s just my American bias at work. The shortness of the entries does at times make too short of work of the related folklore and customs, but at least she focuses on these instead of relying on Hollywood’s version. Fortunately, this deck is so gorgeous and intuitive that it’s likely that many readers will never feel the need to open the book. So if you’re looking to add to your divination collection with a seasonal deck that doesn’t treat Halloween and Samhain like a cartoon, this is an excellent choice. Frankly, I’ll be using it all winter.